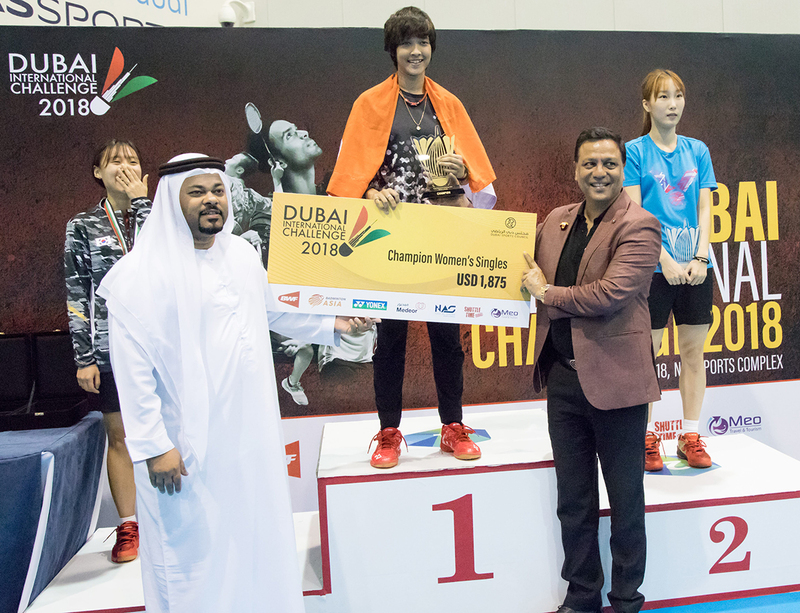 Dubai: Ashmita Chaliha from India won the Dubai International Challenge badminton tournament women’s singles title on Sunday night defeating sixth seed Jeon Jui of Korea 21-19, 21-15 in the final held at NAS Sports Complex. Ashmita is a 19-year-old rising star from India’s Assam state and had even represented India in the Asian Games mixed-team event. This was her first international tournament, and was organised by Dubai Sports Council and UAE Badminton Association with support from Badminton World Federation and Shuttle Time and backed by Medeor Hospital and Yonex. In the men’s singles final, Vladimir Malkov of Russia defeated India’s Subhankar Dey 21-10, 21-15. Ashmita will now proceed to play in the Tata Open India International Challenge in Mumbai. The trophies and prize money were given away by chairman Ghazi Al Madani, and Chair Post Dr Nawab Shafi Ul Mulk, of UAE Badminton Association. In the Women’s Doubles final, Go Ah Ra and Yoo Chae Ran defeated Ji Sun Bang and Jeon Jui 21-14, 21-15. While Women’s Doubles title went to Kim Sang Soo and Yoo Yeon Seong. They defeated Kona Tarun and Kim Wah Lim 21-16, 21-19. The Mixed Doubles title winners were Yoo Yeon Seon and Park So Young. The defeated Denis Grachev and Ekaterina Bolotova 21-14, 17-21, 21-14. Chaliha had got off to a good start and for an early lead of 7-2 in the first game and carried on and in the second game it was a close battle till 13-13. Chaliha then race to win it 21-15.